Parents: Are you “on the fence” re: your child’s schooling next year? Do you know someone who is? Come to the Open House at WDS next Thursday, February 22 from 5-7 pm. Teachers will be on hand to explain the curriculum for each grade, describe classroom routines and activities, answer questions and offer a close-up look at next year’s plans. We realize you have many options for elementary and middle school and we appreciate your choosing us. What sets us apart from other school options???? 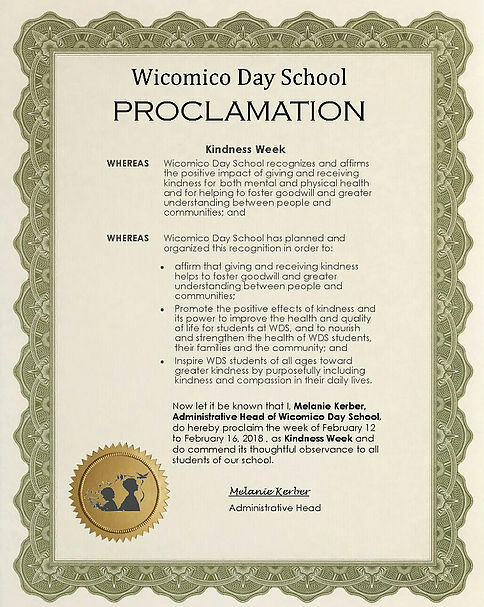 Following this week’s school shooting in Florida claiming 17 fatalities, we write to inform you of the precautions we are taking at Wicomico Day School to ensure maximum safety for your child (ren). The school has an emergency preparedness plan prepared with and approved by local law enforcement. Drills are held regularly. Today, all safety precautions have been reviewed with teachers. Administrators are carrying radios to more efficiently communicate any signs of unusual activity. Administrative assistant Kelli Webster will be using the exterior intercom regularly for guests to identify themselves and the reason for visiting the school before they are granted entry. If you have family members or friends other than yourself collecting your child for any reason, please inform them of this procedure. We ask your patience as we continue to err on this side of caution and do all that is necessary to keep our 310 children safe. Statistically, the best defense against a school incident is heightened awareness. All staff and parents are asked to be aware of unusual activity while dropping off and picking up your child. We have a close working relationship with local law enforcement and multiple parents working in the field. It is our obligation to follow up on these reports and avoid a potential problem. Teachers are on hand in morning and afternoon car pool to assist in any way possible. Parents having questions or concerns in this area are asked to contact the school office and we will be happy to talk with you or arrange a meeting. School administrators are well trained to do all that is possible to avert a tragedy. You will note in our strategic plan that school safety is the top priority and the administrative team and teachers are working daily to fulfill that mandate. The staff and administrators take the safety of each child very seriously and appreciate greatly the burden parents experience when providing an educational haven for children. We are available to discuss this with you at a time of your convenience if questions or concerns arise. Melanie A. Kerber, Ed. D.